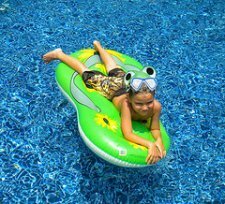 Swimming pool decorations like pool fountains or floating pool lights bring extra pizazz to your pool fun. If you enjoy the pleasant sound of water splashing and the refreshing view of a fountain, then you will love this swimming pool fountain. We've had this one for over a year and love to use it for daytime and evening parties. It provides a cool and relaxing atmosphere whether you are enjoying some time alone or entertaining friends or family. There are different types of pool fountains. Some float out in the middle of the pool connected by a tube to one of the returns. Others attach to the side and provide a cascading fall of water. 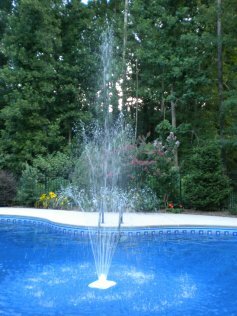 If you would like one that provides light as well consider a LED lighted pool fountain. Swimming pool decorations are for when the sun goes down as well. 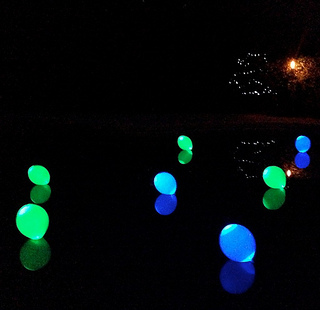 An evening by the pool takes on a new ambience with floating pool lights. If you like a fun disco atmosphere, there are lights that provide patterns of changing fun colors to the bottom of the pool. Floating electronic candles offer a quiet and more elegant feel. Solar pool lights or battery operated lights are some of your other choices. 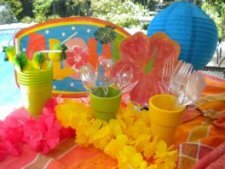 Deciding on pool party decorations becomes easy if you set a theme to your pool party - such as a Flip Flop Party, Beach Party or a Luau. Use a consistent color theme to tie the event together - from the invites, to the table setting and paper goods. Since we have lots of perennial flowers growing in our yard, I often let the color of my flowers determine the party colors. 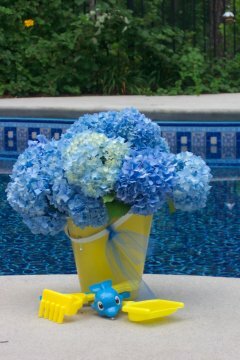 For our beach party, yellow and blue became the theme colors thanks to these beautiful blue hydrangeas. New yellow sand buckets were the vases. 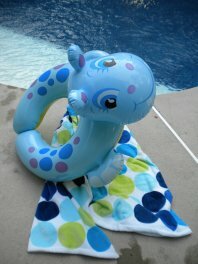 An easy and inexpensive way to decorate for a pool party is to use floating pool toys. Have beach balls floating in the pool for a beach party theme. Or for our jungle pool party we had wild animal beach balls floating in the pool. I couldn't resist getting these flip flop floats for a neighborhood luau party. Hanging paper lanterns are one of my favorite pool decorations. You get lots of pops of color and they can be hung in a variety of places. 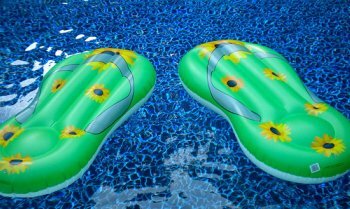 These easy inexpensive decorations bring a festive, party feel for your swimming pool parties - day or night. Having used lots of paper lanterns that have been destroyed by drizzle, downpours or just plain high humidity, I now buy outdoor paper lanterns made of nylon. The same variety of sizes are available from 10" to 30". Of course the larger the more expensive. 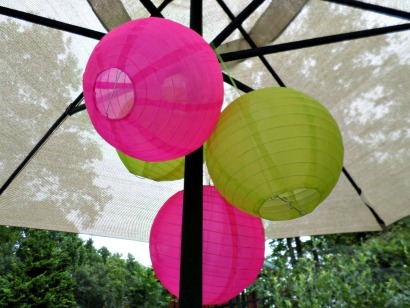 These pink and lime green hanging paper lanterns were used for decorations for our Flamingle Pool Party. We use them for all of our pool parties. 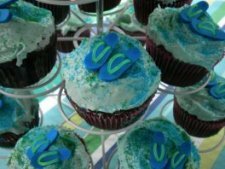 When you decide on the color scheme of the party duplicate the color scheme in your pool party invitations, paper goods and decorations. Hang colorful nylon lanterns on your patio umbrella ribs, in trees near the party area or on shepherd hooks. String them across the food area, hang them near the pool gate on shepherd's hooks or from your umbrella ribs. Durable nylon means you can use them over and over and if it's damp, misting or even starts to rain they will not be ruined. Lighted nylon lanterns come with a bright LED light. Set them out in the sun so the solar panel gets charged up. The on-off switch is on the bottom. What's great about these lighted lanterns is that they can also sit on a flat surface . Use them in your centerpiece or set them on a pillar or ledge for added light. If you said "yes" to any of the above, sign up for my free Pool Fun E-Zine.